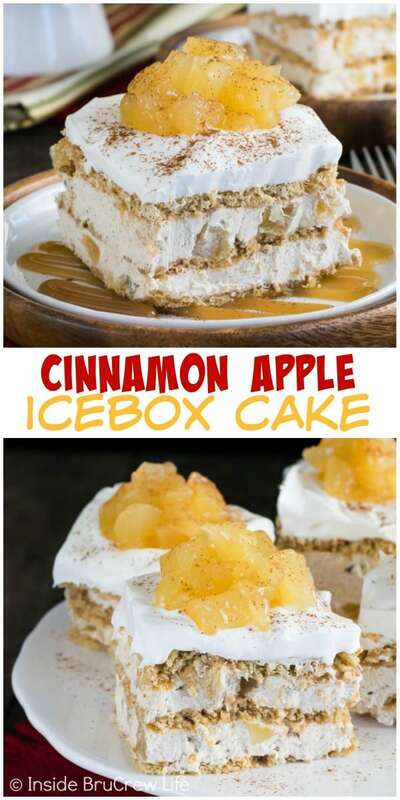 Layers of cheesecake, apples, and graham crackers make this Cinnamon Apple Icebox Cake a delicious and easy no bake dessert. Add this to your fall party plans. Have you ever noticed how hard it is to get back to a work out routine after missing a few days? We had consistently been going to work out each morning since school started, and that routine has been great. My sweet tooth causes me problems in certain areas, so working out is very much needed. But this past month I had a few different work trips, so I missed a few days here and there at the gym. It’s amazing to me that just missing 2 days of training can affect things the next time you get to the gym. Normally I can do most of the workouts without any problems, but after missing days I get winded so easily. Our family was just away for another trip for my husband’s job, and we ate out for just about every meal. And yes, I could have ordered healthier than I actually did, but I didn’t. I mean a new place just begs you to check out local restaurants, right? Now we are kind of scared to go back to the gym after missing 5 work outs and eating so much. I have a feeling the gym and the trainers are going to be hard on us. Another thing that is so hard for me is that gosh darn sweet tooth of mine. No matter what I do, I can’t get past it. To be quite honest, I have given up trying to get over it though. All things in moderation is better anyway! I get comments and questions all the time on how our family isn’t 400 pounds each with all the sugar that comes out of our kitchen. We exercise very regularly, and we really don’t eat that much food that isn’t good for us. Moderation and exercise is all it takes. Go ahead and have one of those Homemade Chocolate Chip Brownies, just not the entire pan. And move. Find some sort of physical activity that you enjoy and do it. For us, cross fit and HIIT training have become our favorite ways to keep in shape. Usually when fall hits, I can’t wait to bake all the things with pumpkin. But this year I have been all over apple treats. This Apple Praline Cake started all the apple madness in our kitchen this year! Sometimes I just want a quick and easy treat that I can put together in minutes. That is where no bake desserts come in handy. 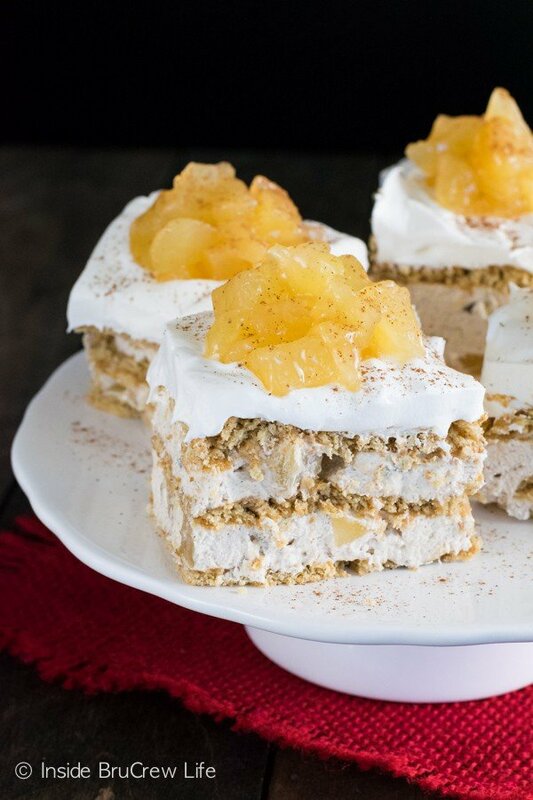 An icebox cake only uses a few ingredients. It can honestly be chilling in the refrigerator in under 15 minutes. Add cream cheese to an ice box cakes gives them a little bit more of a cheesecake feel. 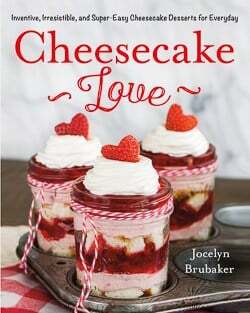 You know how much I love my cheesecakes!!! 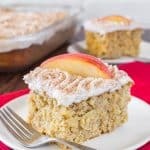 Normally icebox cakes are a summer dessert, but this time I added a homemade Apple Pie Filling to give it a little bit of fall flair! The cinnamon apple cheesecake layered with graham crackers turned out to be a great idea. 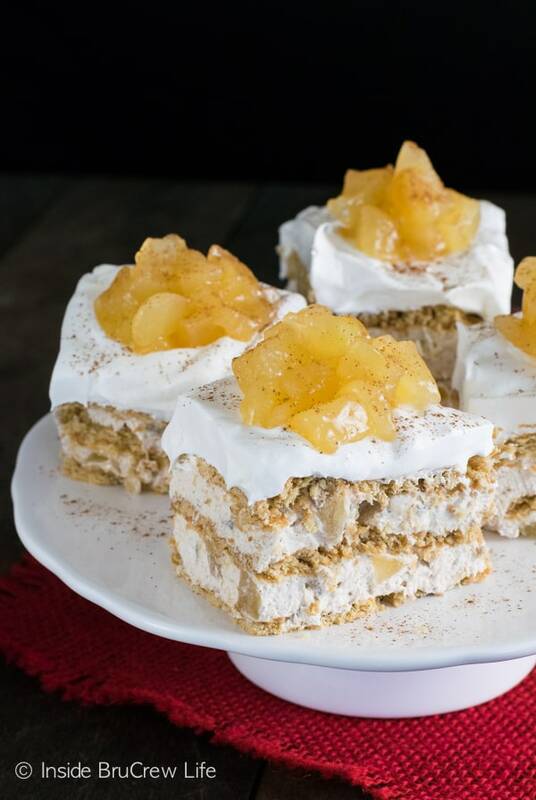 I’m thinking this easy apple dessert would be perfect for any fall party With all the party prep that has to happen, you need some no bake apple desserts, right? 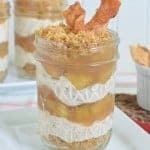 Cinnamon apple cheesecake layered with graham crackers is a delicious no bake dessert for fall parties and dinners. 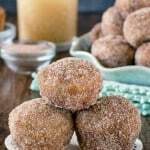 Beat the cream cheese, brown sugar, vanilla, and 2 teaspoons cinnamon until creamy. Stir in 1 cup diced apple pie filling into the cream cheese mixture. Fold in 3 cups of Cool Whip. Spread a thin layer of Cool Whip on the bottom of a 9 inch square baking dish. Place 9 cinnamon graham squares on the bottom. Gently spread half the cheesecake filling on the graham crackers. Place another layer of crackers on the cheesecake filling, then top with one last layer of crackers. Cover the top with 2 cups of Cool Whip. Refrigerate for one to two hours. Cut into squares. Top with remaining pie filling and sprinkle with cinnamon. Store in a sealed container in the refrigerator. I’m mainly at peace with my sweet tooth these days. I figure it’s not going away, so if I just exercise and eat really cleanly when I’m not having dessert, it’ll all balance out. Either way, I’m tired of feeling guilty for loving chocolate. We only live once, and a lifetime of deprivation and guilt seems like a waste. I think balance is the best way to enjoy eating and exercise. It’s the easiest way to stay happy and enjoy life. You got it right!!! And this as a workout recovery snack…yes, please!! Hahaha! Seriously best comment of the week! This was one of my all time favorite icebox cakes for sure!!!! Breaks in your routine are so hard!! I feel ya. Impressive that you have been doing so well since school started! You rock! 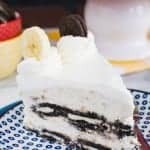 And I’m the same way about restaurants, if someone else is cooking for me, I have to order the most amazing-sounding thing on the menu 🙂 This icebox cake looks amazing Jocelyn!! 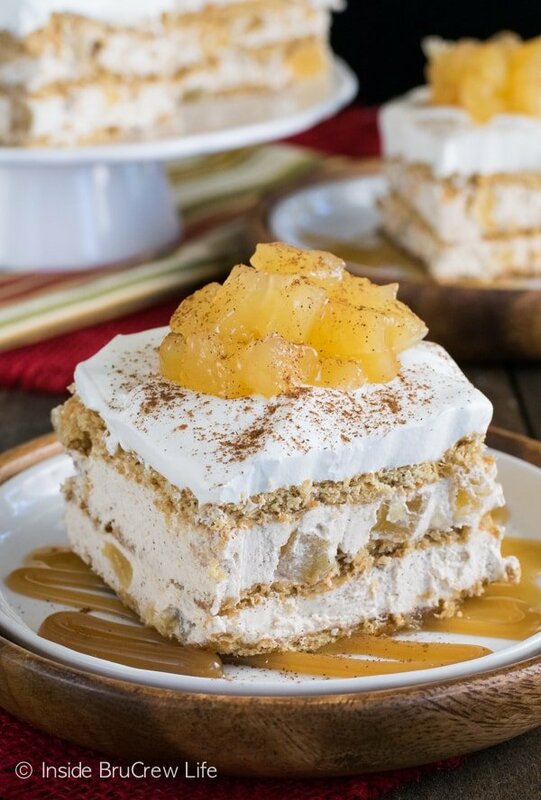 I love no bake desserts, and this one looks so creamy and delicious! YES! If I’m in the groove it’s so easy to do the working out. Once I get off that beaten path it’s a train wreck and so hard to get back into it. I totally agree that the sweet tooth will always be there and it’s moderation. Hopefully everything went well with the trip! 🙂 I’ll start practicing moderation with these delicious treats! Practicing moderation with this cake was truly a hard feat…I may have failed. There is always tomorrow to do better, right? Gorgeous Jocelyn! And I couldn’t agree more. I have a raging sweet tooth and love to eat out but all things in moderation. Exercise for me is a necessary evil, I still don’t like it even though I always feel better afterwards. 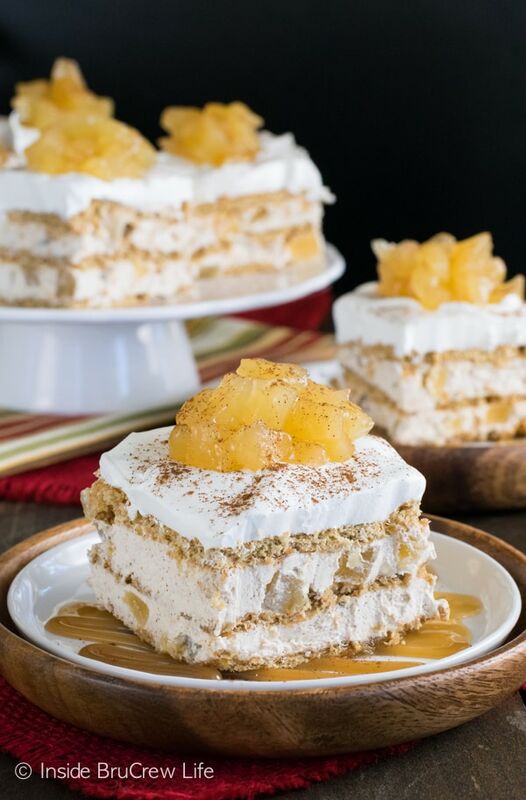 Meanwhile, I am drooling over this gorgeous icebox cake! Cinnamon is the best! Thank you so much, Jessica. I totally think moderation with food and exercise is best. 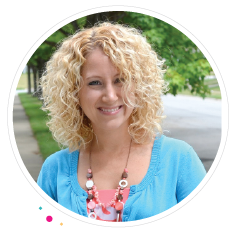 I don’t like it either, but I like my jeans to fit, soooo…it has to happen here too! I really admire your workout routine and how you balance out all your desserts!! Thank you, Julianne. Some days I wonder what I’m doing to myself, but then the clothes keep fitting better, so it makes it all worth it. I definitely need to get back into the workout routine. It’s been WAY too long! 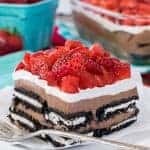 This icebox cake is absolutely gorgeous, Jocelyn! I love the apple flavor! 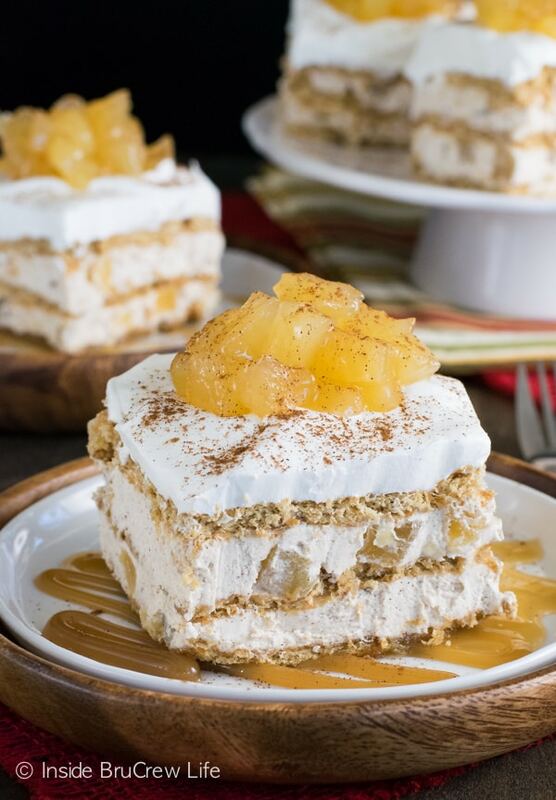 This was definitely a fun flavor of icebox cake to make…and eat. LOL! Getting back to working out is so tough, but it definitely makes you feel better in the long run!!! A big slice of this apple goodness is definitely a good way to recover from working out. LOL! I subbed in S’moreables Gluten Free Graham Crackers and used Cool Whip Lite. Made a little more, enough to fit a 9 x 13 inch pan. Still came out good. i just used my Dairy Digestive aids to prevent the lactose intolerance.